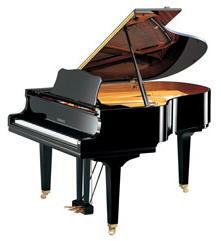 Despite the advances in digital pianos, not least from Yamaha, there’s still nothing like a real acoustic grand piano. Yamaha will be showing off three of them at Winter NAMM this year, including the new GC2 and updated GB1K and GC1 grand pianos. The new 5’8″ GC2 grand piano has the same size, tone and touch of Yamaha’s C2 but is more affordable. It comes in polished ebony and features a simply-styled cabinet, straight leg design, and traditional synthetic key tops. The 4’11” GB1K replaces the GB1 and is well-suited to smaller homes. It features a soft-close fallboard and will be available this month. Finally, the GC1 5’3″ grand piano is of simple style, featuring a new sostenuto pedal and soft-close fallboard. More information on these pianos will be available once the show opens. Recientemente adquirí un piano de cola GB1k Yamaha Serie J2632146 Product Code WQ78260. Quisiera saber la procdencia y el año en que fue construido. Desde ya les agradezco vuestra respuesta.